What You Should Do To Your Landscape In The Spring - Legends Landscape Supply Inc.
Clear away winter’s debris, which means using the wheelbarrow, bow rake and leaf rake to clean up loose twigs, branches and brush from your lawn. Compost them as brown matter. Generally, prune trees and shrubs in fall, after the growing season. Only cut away winter-kill and obvious damage in early spring. If you have dangerous or precarious branches and trees, consider hiring an expert landscape service. Spring is also the time to cut back and divide perennials. Flowering perennials should be pruned to 10-12 cm and ornamental grasses to 5-7 cm. Thin crowded beds and divide them, transplanting the overcrowded plants to areas that need filling. Begin preparing your lawn by using the bow rake to clean out choking thatch. Aerate and fertilize in early spring. 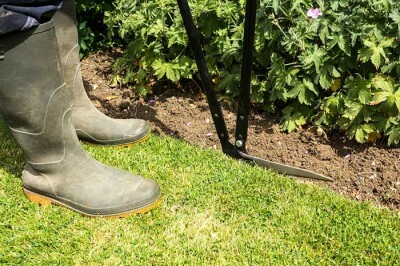 Fill in low spots and use the garden spade to level off high areas. For gardens, an early spring tilling during which you add compost will give you a jump on vegetable and flower planting. If it is not growing but is part of your landscaping or garden, it is hardscape. Replenish crushed stone on walkways and drives. Refill joints in flagstones, add sand between block and brick, and level out frost heaves under pavers. Use a pressure washer to carefully remove leaf stains and algae growth without disturbing pavers and stone. Most outside wood surfaces—fence posts, garden gates, porch railings and light posts—benefit from cleaning, re-priming and fresh coats of paint. If you have irrigation, drainage or lawn sprinklers, get them professionally serviced before use. Winter can be especially hard on ponds and buried pipes. A professional landscape service can inspect backflow prevention devices, valves, and spacing of sprinkler heads to ensure even coverage. The wildlife that thrives in your landscape includes welcome visitors, such as birds, and unwelcome pests. If you fed the birds all winter, spring is an excellent time to tidy up by raking up birdseed waste revealed as snow melts. Use the bow rake to scrape down to soil, and a garden spade to scoop up the waste. Compost it. Garden and lawn pests can be addressed in early spring, too, by preventing spring weeds using landscape fabric (weed block) and limited pre-emergent herbicides. If you have deer or rabbit problems, check your fencing that may have been damaged during winter. To get a handle on the many tasks of spring landscape maintenance, contact Legends Landscape Supplies today. We can help with professional advice and all your landscape supplies.